The chorizo is not an ordinary product. It is not the mass produced meat I had expected it to be. It is not loaded with nitrates and artificial colorants. It is not just another ‘bodega’ meat; an alternative to pepperoni and bacon to be added to sandwiches and to pastas. The chorizo is, quite honestly, a spectacular product. The Spanish larder is unthinkable without the chorizo. It can be fried, added to stews, or simply eaten cold as a salami. 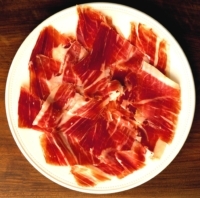 It is the most famous of all Spain’s sausages. Historically created to see Spaniard’s through the tough winters, chorizo provided flavor and nourishment during times of scarcity. Just the scent of the sausage arouses nostalgia. Though it may no longer be the life-sustaining product it once was, thanks to the the advent of refrigeration, the Spaniard continues to revere the product. In Galicia, residents celebrate the sausage in an annual festival. Many eat it as a daily afternoon snack, simply served with toast. 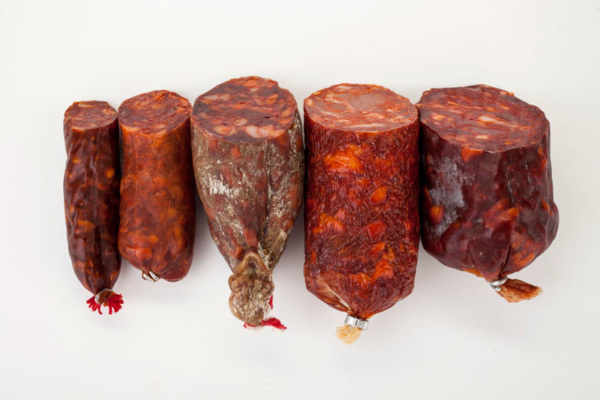 So what is chorizo, and what makes it so uniquely Spanish? There are hundreds of regional varieties, so there is no simple answer. Fully cured, the sausage is ready to be eaten; semi-cured, and it must be cooked. It can be spicy; it can be sweet. It can overwhelm the palate with garlic-y flavors; it can have only subtle notes of garlic. Essentially, chorizo consists of ground pork, fat and spices all stuffed into the make-shift casing of a pig’s intestine. The distinct flavor of chorizo derives from the addition of paprika, which too can vary in taste: hot and spicy or mild and sweet. The chorizo as we have come to know it, is a relatively new addition to Spanish gastronomy. The modern chorizo reflects the story of Spain’s 16th century. It was not until Spanish explorers, such as Christopher Columbus, set sail from the Mediterranean and stumbled upon the New World, that the red sausage was born. Following the discovery of the New World, religious Spaniards set forth to Christianize the New World. When the time came for their return back to Europe, many brought back the seeds of the exotic plants and vegetation they had discovered. And so the globalization of Spanish cuisine was born. Paprika, aka pimentón, is the spice that lends the chorizo its distinct flavor, the warm color and heavily scent. The pepper instantly entered the Spanish diet, though some time past before the ground variant was created. Prior to the arrival of the New World spices, the dry-cured sausage was white (referred to today as chorizo blanco). Delicious though this may be, to think of chorizo in contemporary Spanish cuisine is to envisage the wonderfully hued variety. The chorizo is the most famous of all Spanish sausages. The aroma of frying chorizo is haunting; rustic, earthy and meaty. It is perhaps no surprise then that the Spanish chorizo has been adopted by new cultures across the world. Unfortunately, poor quality chorizo proliferates the global marketplace. However, all it takes is a little inquiry to get your hands on true, authentic chorizo. Within New York, Despana makes some of the best chorizo I have come across.